What is Hold Tight 102? 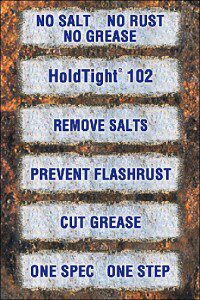 Hold Tight 102 is an eco friendly solution that prevents flash rust while wet blasting. 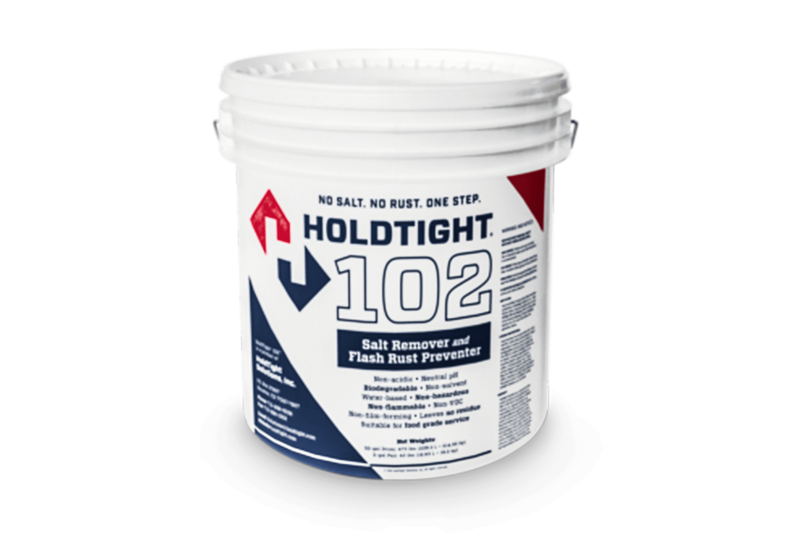 Hold Tight 102 is also a great additive for rinsing after soda blasting, dustless blasting, slurry blasting and vapor blasting. It effectively removes salts and other contaminates. As a rust inhibitor or as a salt remover, Hold Tight 102 is easy to work with and safe. Hold Tight is soluble in water, non-hazardous, non-flammable, phosphate free and biodegradable. With no rain and temperatures above 40°F, rusting will be prevented for approximately 48 hours. Colorless and leaving no residue, surface salts, including chlorides, are undetectable after use. This product chemistry has been approved by the FDA for food grade service under 21 Code of Federal Regulations 178.3400. I own a slurry blaster (i.e. Graco, Farrow, MMLJ, Eco-Quip, Cleaner Blast, Geo-Blast, Greener Blast) -- when I blast metal it usually ends up flash rusting -- will Hold Tight help prevent this? Yes — simply add the Hold Tight to your slurry mix before blasting. This will prevent flash rusting for up to 48 hours, sometimes longer. Is Hold Tight 102 meant to be added to a blast media or is it meant to use on its own when trying to prevent flash rusting? BOTH — Hold Tight can be used as an additive with slurry blasters and poured into the blast pot at the same time you are adding water and media. Hold Tight can also be used upon completion of blasting. A “post-blasting” rinse cycle is a quick and easy way to prevent flash rust. Hold Tight is classified as non-hazardous, non-toxic, Biodegradable, Phosphate and acid-free, Non-flammable, and leaves behind no residue. This product can also be used in FDA and USDA regulated facilities and fully complies with 21 CFR 178.3400. When we ship out Hold Tight to our customers it goes out as a standard shipment — no special handling is required. What are the directions for using Hold Tight 102? 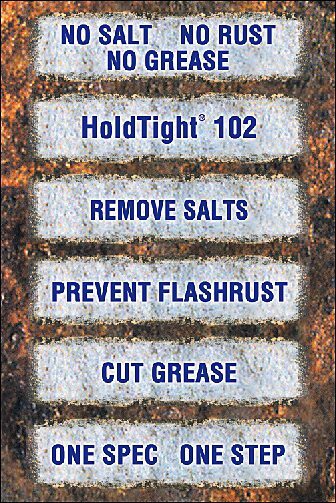 Hold Tight is easy to apply and works well in any standard pressure washer at 500 PSI. With no rain and at temperatures above 40 degrees, rusting will be prevented for about 48 hours, often longer. Can you give me an estimate for how much product needs to be ordered for different size projects? A little Hold Tight goes a long way — the recommended usage ratio is usually 100:1. Usually one gallon is plenty to rinse one car. For larger projects, we carry 5 gallon pails.